*This section details how the timesheet records from external time management systems can imported into the Microsoft Dynamics 365 for Finance & Operations. 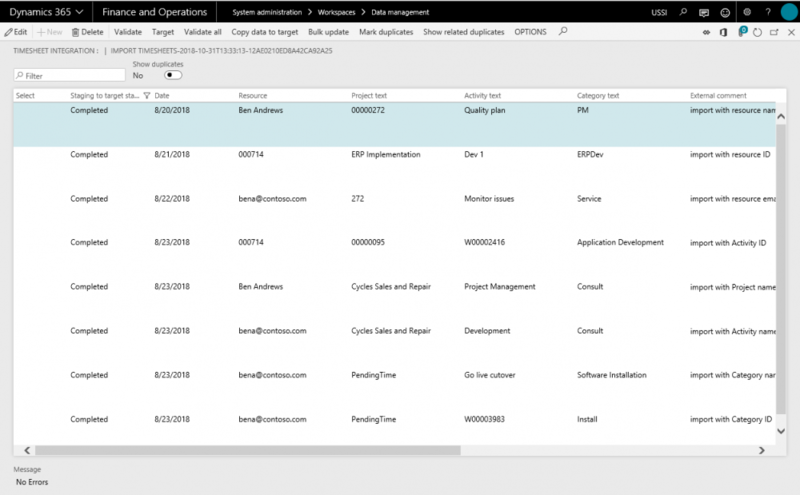 The timesheet records can be imported into the Microsoft Dynamics 365 for Finance and Operations using the ‘Timesheet Integration’ data entity created to facilitate this process. External comment User can keyin the external comments on this column. Internal comment User can keyin the internal comments on this column. Date Provide a date for timesheet line. Submitted hours Enter the hours you intend to sumbit to timesheet. Resource Enter the resource for whom this line needs to created. On this field, you can enter Resource name, Personnel number, Email ID of the resource or the Email ID of the user associated with the resource. Project legal entity Enter the legal entity of the project, where the project on this line exists. 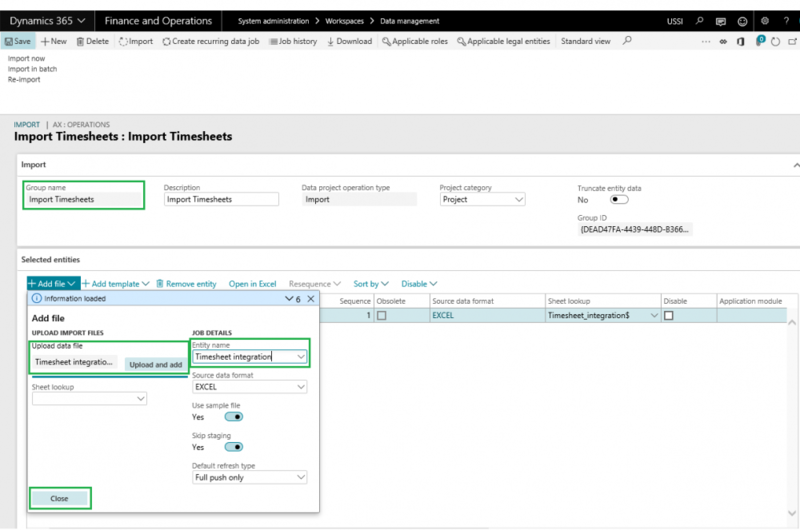 Timesheet legal entity Enter the legal entity where the timesheet record to created. Project text Enter project against which this line needs to be recorded. You can use Project ID or Project name to get to the right values. Activity text Enter activity against which this line needs to be recorded. You can use Activity ID or Activity name to get to the right values. Category text Enter category against which this line needs to be recorded. You can use Activity ID or Activity name to get to the right values. Work location text Enter work location against which this line needs to be recorded. You can use Activity ID or Activity name to get to the right values. Transfer to timesheet This field accepts ‘Yes’ or ‘No’ values. If ‘Yes’, a timesheet line can be created, provided there are no errors on the line. ‘No’ will retain the line on Timesheet integration form. Timesheet Integration sample file can be found here. Note: None of the fields in the timesheet integration data entity are mandatory, so if leave fields empty integrations will still go ahead and create the records on the timesheets integration form. On integration form, you edit the records accordingly and transfer them to timesheet. Process to Import PTO balances. The process to import the PTO balances is as follows. Navigate to Workspaces > Data management > Import. Enter group name and description in the import tab\section. Click Add file on the selected entities tab\section. Enter ‘PTO Balances’ entity name. Click upload and add to select and upload the source data file. Source data will be the external HR or payroll file. Once the information is loaded, close out the form. Now go back to the main form and click Import. Once the import process is executed, for success or failure, the Execution summary can be reviewed. Also you can view the staging data by navigating to the relevant form.